Initial Outfitters is a party plan company that offers a unique collection of personalized jewelry, accessories and other giftable items. With Initial Outfitters you can truly Personalize your Style! Alicia and Jim Storbeck officially launched Initial Outfitters in 2006 after years in corporate america and living through job related relocations and downsizing of departments they knew it was time for a change and to make an impact for financial independence from corporate america not only for themselves but for many others as well. As Initial Outfitters has grown over the last nearly 10 years, they have found others that have shared their dream of success and helping others succeed at the same time and have built a home office team that is dedicated to that dream and focus. Initial Outfitters has a partnership with Charlie’s Lunch ministries and both the Independent Sales Consultants and Home office are dedicated to the message and ministry that Charlie’s Lunch brings to the population. Charlie’s Lunch is a very important part of who Initial Outfitters is as a whole and the meaningful purpose it gives their company and consultants. Charlie’s Lunch is a foundation that feeds hungry children all over the world and Initial Outfitters supports this organization with the help of it’s customers with a donation from specific products and Lunch Money Collections at parties and other events. Independent Initial Outfitters Consultant Lynette Jeffres sent me the beautiful Ornate Cross pendant personalized with my initial and the Vintage 24” Silver Aged link chain and an accent crystal dangle. When I first opened the package I thought this cross may not work with anything I wear and would be clunky, but then I put it on and I fell in LOVE! It literally goes with ANYTHING and is the perfect size and length. It’s rare to find me without some sort of jewelry accessorizing at least one part of me, except of course for the gym (and even then I often at least have earrings on) and this piece has been a top pick most days since I received it. The cross has beautiful detail in the scroll work on it and wonderful shaped curves and lines and I love the aged look of it. I also like that because it has my initial on it, it’s one of the few pieces I own that my two Diva Daughters don’t try to claim and wear out of the house! This makes Initial Outfitters a win in my book because this is a product that is totally my own. 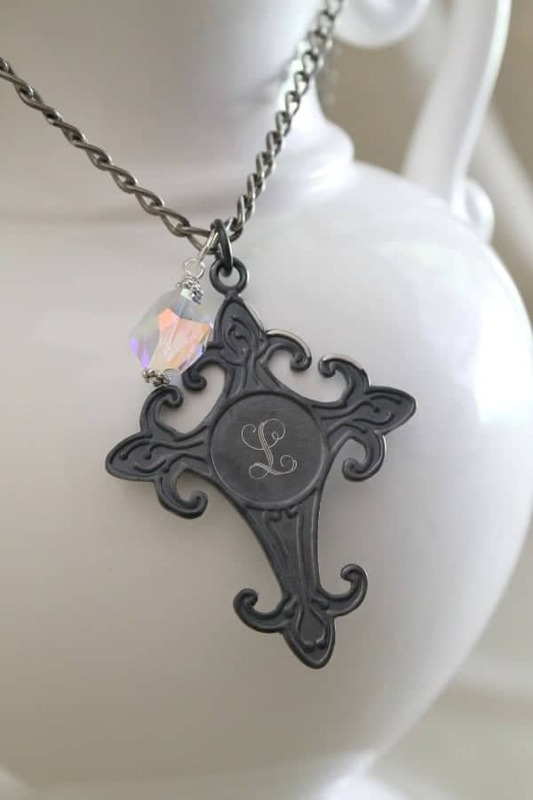 I love the idea of also being able to wear the chain with other pieces that I have already from Initial Outfitters and or adding accents to the Ornate Cross pendant such as the accent crystals or charms (which I noticed I could choose various shapes and finishes and place my daughters initials on as well). The Silver Aged link chain is also available in several other sizes. All of these pieces are part of Initial Outfitters Generations Collection which allows you to create something completely unique and that represents the person wearing the piece. There is so much more to Initial Outfitters than just their humble beginnings and their philanthropy, their mix of vintage inspired to classic and modern jewelry pieces as well as a broad product line of totes, fashion accessories and other giftable items that can be personalized how YOU want them to be is what makes Initial Outfitters a company that has something for everyone!